Although tradition has it that an ancient 12th century fortress once stood on this site, the earliest material remains that still survive date from the mid 15th century and are contemporaneous with the first seigneurs of Oca of whom there is documentary evidence: Álvaro de Oca and his son Suero. The latter fought on the side of the Count of Camiña, Pedro Álvarez de Sotomayor (better known by his nickname, Pedro Madruga) in the struggles for succession to the Crown of Castile in the last quarter of the 15th century that pitted much of the Galician nobility who supported Henry IV's daughter (Juana "la Beltraneja") against the powerful archbishop of Santiago, Alonso de Fonseca, who backed the cause of Princess Isabella, the future Isabella the Catholic. The prelate, aided by the Count of Monterrey's troops, punished the seigneur of Oca by seizing the estate and its fortress in 1477. Fonseca's victory brought the seigneurship under the jurisdiction of the archbishop of Santiago until 1564, when it became Crown property. By means of a deed of sale signed at El Pardo on 15 November 1586, Philip II sold the Oca estate, with its civil and criminal jurisdiction, to a lady called María de Neira, daughter of a councilman of Santiago de Compostela, Juan de Otero y Neira, and the widow of another, Gonzalo de Luaces, for 195,775 maravadíes. María de Neira was succeeded in the seigneurship of Oca by her son Juan and her grandson Gonzalo, who died without issue and bequeathed his possessions to his eldest nephew Juan Gayoso Neira, the son of his sister Catalina de Neira y Mendoza and Juan de Gayoso Noguerol, lieutenant and councilman of the city of Orense. Of his marriage to Urraca María de Moscoso Ozores y Sotomayor was born Andrés Gayoso Neira, the person who, on the one hand, actually set in motion the conversion of the former fortress of Oca into a palace and, on the other, established the marriage alliances that would incorporate the seigneurship of Oca into increasingly important noble families. Andrés Gayoso wed Constanza Arias Ozores, lady-in-waiting to Queen Isabella de Farnese, who inherited from her mother the countship of Amarante and from her father, among other seigneurships, that of San Miguel das Oenas y La Mota, which Philip V raised to the status of marquisate in 1719. The eldest son born of this marriage, Fernando Gayoso Arias Ozores, in addition to enlarging the palace and erecting the chapel, also added to the family possessions by marrying María Josefa de los Cobos Bolaño, who inherited important territories such as the marquisate of La Puebla de Parga and the seigneurships of Cillobre, Junqueras, Torés and others. When the couple's firstborn, Francisco, died without issue, he was succeeded by his brother Domingo, who, owing to an unusual series of deaths, inherited all his parents' titles and territories and acquired, in addition to very important seigneurships, the titles of Count of Rivadavia, inherited from his mother's cousin Diego Sarmiento de Mendoza, and Marquis of Camarasa, Count of Ricla and Count of Castrogeriz when his mother's cousin Baltasara Gómez de los Cobos died without issue. Domingo Gayoso de los Cobos thus became one of the foremost Spanish nobles of the late 18th century and, although he did not make a particularly significant contribution to Oca, he did to Galicia's architectural heritage, as among other works he was responsible for the construction of the magnificent facade of his residence, the old palace of the Counts of Amarante, which now houses the Palacio de Justicia. His son, Joaquín Gayoso de los Cobos y Bermúdez de Castro, during whose lifetime the seigneurships were abolished, was the last Seigneur of Oca and its first proprietor. His wife Josefa Manuela Téllez Girón, daughter of the Duke and Duchess of Osuna, bore him six children, among whom the family inheritance had to be divided according to the new laws of the liberal state. Oca, along with the title of San Miguel das Penas, went to María Encarnación Gayoso de los Cobos, while the main titles and properties were bequeathed to their firstborn Francisco de Borja Gayoso de los Cobos y Téllez Girón, who died without issue in 1860, leaving all his possessions to his brother Jacobo. Jacobo married Ana María de Sevilla y Villanueva, who bore him three daughters who were orphaned at an early age and spent long periods at Oca in their care of their aunt María Encarnación. The eldest daughter, Francisca de Borja, inherited the lion's share of the estate of the House of Camarasa from her father in 1871 and also received the Palacio de Oca from her aunt, who died without issue. Francisca married Ignacio Fernández de Henestrosa y Ortiz de Mioño, Count of Moriana del Río and Marquis of Cilleruelo, and their eldest son Ignacio Fernández de Henestrosa y Gayoso de los Cobos inherited his parents' titles and the ownership of Oca. As this 14th Marquis of Camarasa and his wife, a daughter of the Duke and Duchess of T'Serclaes, had no issue, in 1948 the properties and titles of the House of Camarasa passed to their niece, Victoria Eugenia Fernández de Córdoba y Fernández de Henestrosa, the current Duchess of Medinaceli who, in order to conserve, study and disseminate the historic and artistic heritage linked to her family, set up the Ducal House of Medinaceli Foundation in 1978, endowing it with many monuments and artworks, prominent among which is the Palacio de Oca. The early fortress of Oca, which was lost by Suero, may well have consisted of two towers linked by a battlemented construction. In the last third of the 16th century, during the period of the Neira family, a few changes were made of which clear testimonies still remain. The doors located on either side of the lobby, crowned by the coats of arms of the Neira and Luaces families, indicate their involvement in the early fortress--long before the 18th-century alterations. The arms of the Neira, Luaces, Bermúdez de Castro and Mendoza families are still visible on some of the gateways built into the wall surrounding the gardens, bringing to mind the idea of an ancient orchard formed by terraces and walled in accordance with the ideal of the hortus conclusus that the Renaissance inherited from the medieval period, where work would have already begun on the system to convey water across this walled enclosure and ultimately into an artificial lake located on the site of what is now the upper lake. Nevertheless, it was in the 18th century, particularly the first half, when work to remodel and extend the complex was stepped up. The chief promotors of these works who were responsible for the current appearance of the Palacio de Oca and its gardens, completely converting the former fortress into a magnificent palace, were Andrés Gayoso, Seigneur of Oca and, through marriage, 6th Count of Amarante and 1st Marquis of San Miguel das Penas, and his son Fernando. The stone masonry was executed almost entirely by the master craftsmen Esteban Ferriero "the elder" and his son by the same name, known as "the younger", both from the parish of Moimenta in the district of Los Baños. Andrés Gayoso rebuilt the old medieval tower and remodelled the section of the facade that overlooks the square and, in order to leave a record of his involvement, had his family coat of arms carved on one of the sides of the tower. But the most important work promoted by this 6th Seigneur of Oca was to design and build the artifical lakes which Otero Pedrayo described as being "worthy of a cardinal's villa" and which even today, despite the numerous alternations they have undergone, continue to form the central axis around which the gardens of the Palacio de Oca are laid out. This axial nature stems not only from their physical location but from the double fact that, on the one hand, they concentrate within a small space the Baroque style of the architecture and garden design and, on the other, symbolise the combination--characteristic of this and indeed of all the gardens of country estates of this kind--of highly sophisticated aesthetic principles and the original productive purpose these water reservoirs served at least from the late 16th century. In this area, which is doubly delimited by a stone wall and a hedge, Andrés Gayoso intended to develop a conceptual idea whose full significance escapes us today. He had two vessels built in stone--a warship and a fishing boat--and a figure, the lord of the serpent, as an intermediary between the two worlds: the calm waters of the upper lake, known today as that "of the virtues" and the turbulent waters of the lower lake known as that "of the vanities". The location of these artificial lakes, at a diagonal to the longitudinal axis of the main palace corridor, may seem odd to the inattentive observer, yet it is a logical solution based on two conditioning factors: on the one hand, use of the waters of the river Boo, which crosses Oca's orchard (the current lakes were built on the site of a former water mill and the related lake, which we know from the will of Doña María de Neira already existed at least by 1594); and on the other, the location of the chapel towers, with which it is aligned. The choice of the chapel as an axis is no chance matter, and should be taken into consideration when interpreting the meaning of the lakes. The works carried out on this area, which are fairly well documented in the Medinaceli Ducal Archives (Oca section), began in the second decade of the seventeen hundreds and dragged on for at least fifteen years. During this period the former lake of the old mill was replaced by two lakes with stone masonry separated by a bank and the water mill was moved from its original site (quite possibly the landing stage of the lake of the vanities) to the top end of the lake of the virtues. The box plantations surrounding the lakes must date at least from this period, which makes them at least three hundred years old. The series of works described, which continued without interruption, the next starting no sooner was the previous one complete, indicates a preconceived plan. What is more, the concern conveyed by the works contracts over the symbolic representations of the stone figures--"well shaped and carved stones of artillery [...] about to shoot"; "two lions [...] their blazons projecting"--and over the effects of the water when falling, "whose water is to spout from the mouth of the said serpent [...] must fall into a round five-palm basin", unmistakeably denote the intention to develop a very precise message. It seems evident--or at least that is the most plausible hypothesis--that the 1st Marquis of San Miguel das Penas intended to represent the lakes as an inverted boat (instead of surrounding the ship, the waters fill it) navigated by two smaller boats , forming a symbolic and polysemous contrast between earth and hell, and the vanity of this world (represented by the lower warship) and paradise (symbolised by the upper fishing boat), presided over by the chapel, which appears to float among the vegetation. As clear as this interpretation may seem, it omits many elements that would need to be incorporated into a more detailed explanation. For example, it does not take into account the heraldic monsters that adorn the warship, or the battlements and spheres (cannon balls) that surround the lakes, or the role played by the gentleman with the serpent, over whose appearance the marquis took special care, as can be deduced from the contract which specifies: "[...] a giant of the size and structure nine palms high and everything else in proportion, with his robes and with his cape and cap, with a sperpent on his shoulder, perfect in every way, which is to serve as a jet and conduct for receiving all the water that flows out of the upper lake into the lower lake, whose water must spout out from the mouth of the said serpent [...]"
This figure clearly alludes to the founding myth of the Neira lineage, as according to Don Servando "they descend from Darío, the great hunter, son of the Wolf Queen, who killed a serpent on the bank of the River Arce, now called Neira, from which they took their name and where they established their family seat". Since this Wolf Queen is linked by other myths to the apostle St James and to the Christianisation of Galicia, it is not hazardous to guess that the lakes hold a genaeological-religious message that has yet to be deciphered. This idea is further reinforced by the fact that after Andrés Gayoso died, his son Fernando Gayoso y Arias Ozores, without interrupting the work on the lakes, undertook the construction of the current chapel, possibly on the side of the former oratory of María de Neira. This chapel dedicated to Saint Anthony, whose image carved by the sculptor José Gambino around 1750 is one of the most representative of 18th-century Galician sculpture, became the central structural element of both the gardens and orchards and also of the forecourt--then the work yard of the country estate--embodying the existing 18th-century social relations with the fortress/palace on one side and a group of folk dwellings on the other. The unfinished south wing of the palace is also the work of the 2nd Marquis of San Miguel das Penas who, in order to encourage his descendents to continue with the building that would enclose the yard with constructions of the same height, gave instructions for an arm with a hand pointing eastwards preceded by the inscription "Prosiga 1746" (Onward 1746) to be carved on the last ashlar stone he put in place. His children did not comply with his wishes, but it indicates that the contributions of the first two marquises of San Miguel las Penas followed a preconceived plan and, as various writers have pointed out, a project that was more ambitious than what was actually accomplished. Emilia Pardo Barzán, for example, stated that had it been fulfilled, the building would have almost become a second El Escorial: "de haberse cumplido el prosígase que en un extremo del viastísimo edificio escribión un inquietador, hoy sería casi un segundo Escorial". The works carried out in the second half of the 18th century were of lesser significance. Francisco Gayoso and his successor--his brother Domingo, who also became the 11th Marquis of Camarasa at the end of the century, made a few alterations to the main section of the palace, commissioned the crafting of the wash trough of the Carrera del Conde and the fountain of the Trout, extended the former reservoir, incoorporated a few new plots and completed the wall enclosing the garden. 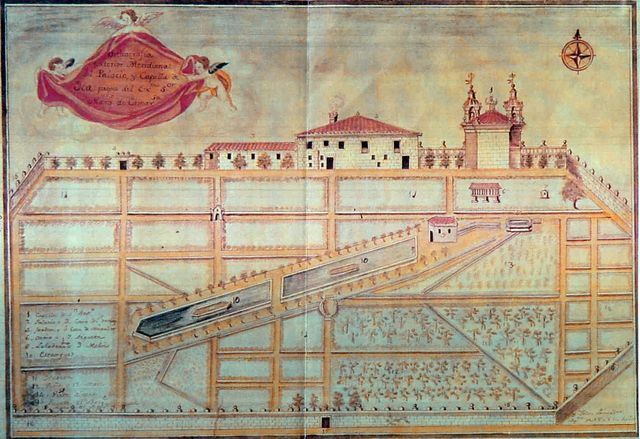 The result of all these 18th-century transformations is reflected in a plan entitled "south exterior elevation of the Palace and Chapel of Oca", known as the Plano de Peinador, which was drawn up in 1805 on the instructions of the last seigneur of Oca, Joaquín Gayoso de los Cobos, 12th Marquis of Camarasa. This plan, which should be interpreted with caution as it is not intended to be a scale representation of reality but more of a diagram, shows a garden laid out in grid fashion in formalist style with numerous architectural elements and perfectly aligned plantations, in which it is very difficult to discern the part given over to an ornamental garden from the part used for growing fruit and vegetables. The lack of proportions of the Plano de Peinador and its odd orientation make it difficult to compare with more recent plans, though if it is studied carefully it is possible to identify the grid pattern of the 18th-century garden despite the numerous subsequent reforms. The landscape architect Consuelo Martínez Correcher deduced from studying the documents relating to Oca in the Medinaceli Ducal Archives that this 18th-century garden "was a delightful, delicate and palatial orchard with the dual purpose of utility and beauty, the 18th-century ideal. Its aspect of ornamented orchard was provided by the medicinal plants that surrounded those cultivated as foods". In the second half of the 19th century, the Marquis and Marquise of San Miguel das Penas, Manuel Fernández de Henestrosa and Mª Encarnación Gayoso de los Cobos, entrusted the garden architect of the Royal Palace who designed the Jardín del Moro in Madrid, Francisco Vié, with remodelling the gardens. Once again a plan, this one entitled "Possession of the Most Honorable Marquis and Marquise of San Miguel das Penas", drawn up on the orders of Ignacio Fernández de Henestrosa y Ortiz de Mioño in 1879 with the aid of the Geographical and Statistical Institute, gives an extremely clear idea of the result of this work, which was mainly centred on designing landscape plans for the areas of garden closest to the palace and, very possibly, on opening up the gardens to the Guillufe forest with a plantation of lime trees laid out in the manner of an avenue that accentuated a pre-existing path ending in a clearing in the forest from which departed several paths leading in all directions. The work extended to the yard, which was edged with lawn and plants, all four quarters of the garden nearest the chapel, whose sober geometry was replaced by winding borders, the water mill, onto which was built a Swiss chalet of which there are photographs, and the area that is known as the wood or Vié's garden as it the only area that still remains as it was designed by this French landscape gardener, forming a triangle that borders on the aqueduct, the camelia path and the reservoir of the streams. For Oca, the 20th century was a period marked by restoration more than creation. The Marquis of Camarasa, Ignacio Fernández de Henestrosa y Gayoso de los Cabos, in a clear attempt at revival in the 1920s, tried to erase the imprint of romanticism Francisco Vié had stamped on the gardens in order to restore their original formalist design. Fifty years later this work was continued by his great nephew, the current Duke of Segorbe and President of the Medinaceli Ducal House Foundation, Ignacio de Medina y Fernández de Córdoba, though with a different criterion that does not seek to recover an irreal, pristine purity of the garden but to rehabilitate it with the twofold aim of respecting all the styles--Renaissance, Baroque and Romantic--that coexist at Oca in such splendid harmony and to preserve its dual nature of ornamental garden and productive orchard that has remained unchanged throughout its lengthy history. Therefore, more decorative plants and genuine botanical monuments are grown alongside seemingly mundane plantations such as kiwis, apple and pear trees, among others, which amid such beauty, contribute both to accentuating it and to reminding us, with the background noise of the wheels of the mill grinding corn, that a pazo was, above all, a self-sufficient production unit. This timeline is designed as an educational instrument which, in the manner of a virtual voyage through time, provides a quick glimpse of the history of the building from its construction to the present day. It is arranged in four contextual levels, which are, from bottom to top: the history of the Seigneurs of Oca, that of the palace, that of Galicia and general history. Each moment in the history of the monument is illustrated by photographs located in the foreground which, when clicked on, provide access to a brief explanation of a specific aspect. In the background, as a spatial-temporal backdrop, you will see pictures of other Galician buildings erected around the same time and indicating the timespan they occupy. Use the arrows in the bottom corners to move towards the present or past.